Atlanta has been making great strides to provide new transportation options for intown living as well as for the many visitors to our city. Projects have been slow going, but include The BeltLine and the Atlanta Streetcar. The Atlanta Streetcar is a transportation project focused on the Downtown district, which includes many offices and a number of popular tourist attractions including the Georgia Aquarium, CNN Center, The Georgia World Congress Center, Centennial Olympic Park and The World of Coca-Cola. The Streetcar will run on rails through the city. It's similar to what you might see in San Francisco, with it's ubiquitous cable cars. The Atlanta Streetcar will feature a single cable running above it. Many U.S. cities, including Boston, Philadelphia and Seattle, have some form of light rail transit like a streetcar. The Atlanta Streetcar will be built in two phases. The first phase focuses on the East-West line and will run from the Martin Luther King Jr. memorial area into Downtown, sweeping by Centennial Park. Phase two of the Atlanta Streetcar route will take the line north to Marta's Art Center station, ending on the South end at Five Points Station. An exact map for this area has not been drawn at this time. Eventually, the Atlanta Streetcar is planning to stretch all the way from the Fort McPherson Marta Station up to the Brookhaven Marta station. Organizers feel strongly that streetcars are an ideal alternative to buses and train systems like Marta, and are better suited for short-distance travel. Streetcars are more eco-friendly than buses. They can also move more quickly, as they aren't impacted by traffic. Travelers often see streetcars as a more convenient and attractive service than riding the bus. Construction is slated to begin in late 2011, with the focus being placed on the East-West line. They are forecasting that service will begin in mid-2013. Many city streets will be affected by the on-going construction throughout 2012. Marta has announced a number of bus routes that will be re-routed, effective beginning October 8, 2011, to accommodate the construction. Based on studies of other cities who have implemented similar streetcar systems, Atlanta hopes to see somewhere between 12,000 - 17,000 one-way trips per day once the North-South and East-West lines are complete. 11 - 14% of these riders are expected to be people who previously traveled in single occupancy vehicles, so it should reduce some traffic on intown streets. Currently, the proposed system hours would be 5:00 a.m. to 11:00 p.m. weekdays; 8:30 a.m. to 11:00 p.m. Saturdays; and 9:00 a.m. to 10:30 p.m. Sundays. Proposed ticket prices for the Atlanta Streetcar have not yet been announced. The Atlanta Streetcar will serve as a shuttle through areas under-served by current Marta routes, but will also connect riders to Marta stations for those needing to travel to other areas of Atlanta. The Atlanta Streetcar is a part of a greater plan called The Connect Atlanta Plan, which aims to "increase urban mobility, sustainable development and the livability of the City of Atlanta." 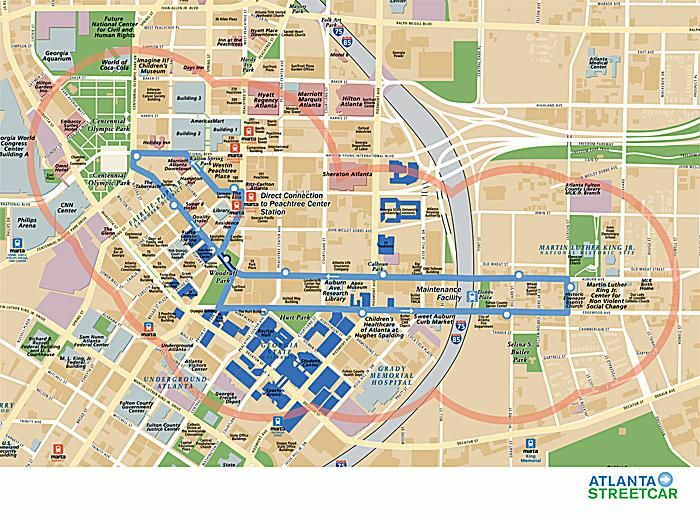 The Atlanta Streetcar plans to eventually connect with parts of The BeltLine and will provide access to many Marta stations. The East-West line connects to the Peachtree Center Station and it will include many more in the future. The Connect Atlanta Plan is a greater transportation initiative to bring better options to intown Atlanta. Right now, many of the plan's proposed projects are just ideas. Slowly they are starting to become a reality, with individual parts of the plan like the Atlanta Streetcar and The BeltLine taking off and gaining funding and support. You can view a detailed map of each of Atlanta's neighborhoods and see what's (possibly) in store for your community as Atlanta works to become a more user-friendly city. Streetcars used to be a primary form of transportation in Atlanta and other American cities, pre-World War II. Most systems were shut down, and many cities that currently have streetcar service are operating on completely new systems. Atlanta's original streetcar system helped form many of the neighborhoods that are popular today, particularly the areas East of Downtown like Inman Park (considered Atlanta's first suburb), Virginia Highland and the neighborhoods down Ponce de Leon and Dekalb Avenue all the way to Decatur. The streetcar lines also went north into the Buckhead and Howell Mill areas. In the late 1800s', the Atlanta streetcar was known for the Nine Mile Circle (also known as the Nine Mile Trolley), which formed a loop between popular neighborhoods - much like The BeltLine will today. In the late 1940s', Atlanta transitioned from streetcars to buses and the tracks were covered up and paved as roads. The Atlanta Streetcars being built now will be modernized for today's travelers, with handicap accessible features, air conditioning and other comforts we've come to expect.